This essay makes comparisons between the money supply of 25 selected economic areas and discusses the ratios between the values of official gold reserves to outstanding currency. For the purposes of this essay, the Euro-Zone includes the thirteen countries that use the Euro currency: Austria, Belgium, Czech Republic, Finland, France, Germany, Greece, Ireland, Italy, Luxembourg, the Netherlands, Portugal, Slovenia and Spain. China includes Hong Kong. All other economic areas are individual countries. These 25 economic areas include 38 countries and make up 89.6% of the world's GDPand 65.1% of the world's population. The Bank of International Settlements (BIS) has a link on their website which lists all of the central banks for different countries. The following charts use money supply data from these official websites. The link to the raw data is at each country's name. There exists variability in the methodology for calculating different monetary aggregates. This makes cross-country comparisons difficult. Money is defined across a continuum from narrow money that includes highly liquid forms of money (money as a means of exchange) to broad money that covers less liquid forms of money (money as a store of value). In general terms, M0 refers to outstanding currency (banknotes and coins) in circulation excluding vault cash. M1 is currency plus overnight (demand) deposits plus vault cash. M2 includes the sum of M1 and savings deposits (agreed maturity of up to two years or deposits redeemable at notice of up to three months). M3 is the sum of M2 and repurchase agreements, money market fund shares/units and debt securities up to two years. Additionally, not every country publishes all four of the common monetary aggregates. For instance, the Bank of England does not publish official numbers for M1, M2 or M3. For this article, estimates using European Economic and Monetary Union (EMU) aggregates for the U.K. are used. These standards are based on those employed by the European Union. Some countries, such as the U.S. do not officially publish M0. Where available, figures for outstanding currency in circulation were used. The U.S. Federal Reserve ceased publishing M3 on May 23, 2006. However, various independent sources have continued to publish U.S. M3 figures and one such source is used here for U.S. M3 money supply. The money supply levels for each country were converted into U.S. dollars on July 11, 2008 at the displayed exchange rates for ease of comparison. The last column shows the date at which the money supply data is taken from. When considering M3, the total money supply exceeds US$60.2 trillion! Of this amount, the U.S., Euro-Zone and Japan account for US$33.1 trillion or 64.4% of the total. The following graph shows a cross-country comparison for M3. Please note that the writer was unable to locate official M3 money supply values for China, Indonesia, Norway, and Russia. For these countries, M2 figures were substituted for M3 in the above figure. As a result, these four countries are underestimated. Of the selected economic areas the annual increase of M3 ranges from under 1.0% year over year for Japan to nearly 40% for the United Arab Emirates! Higher growth rates for money supply do not translate to overall prosperity in the long run. If it did, humanity would have eliminated poverty long ago. Instead, what occurs is an inflationary boom followed by a recession. A hyperinflationary period may occur should confidence in the currency vanish. See a detailed list of failed currencies here. 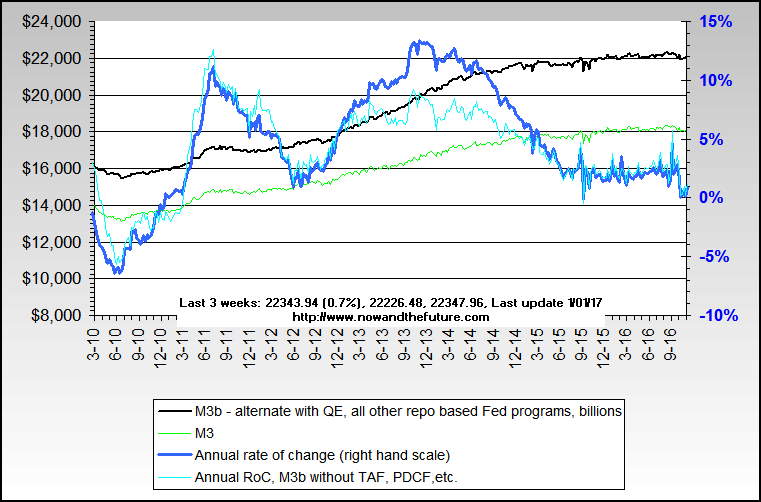 The overall weighted annual M3 money supply growth for all areas covered in this essay is 12.4%. Where M3 figures are not available, M2 figures are substituted. Last year, the total M3 money supply for these 25 economic areas was US$53.7 trillion, now it is US$60.3 trillion. The total for M0 (currency in circulation) for the above 25 economic areas amounts to US$3.92 trillion. Using the same calculation as for determining overall M3 money supply growth we find that overall M0 and/or total amount of currency is increasing by 6.6% per annum. The value for the top three currencies in circulation - the USD, Euro and Yen, comprise 66.2% of the total value of all currencies discussed here. According to the World Gold Council, at the end of 2006 the central banks of the 38 countries within these 25 economic areas held 24,170 tonnes of gold. This represents 91.3% of the gold held by all countries of the world. As of July 25, 2007 the closing price for a troy ounce of gold was US$964.10. There are 32,150.75 troy ounces in a metric tonne. Thus, the value of the gold held by the 38 countries is US$749.2 billion. The total value of the currency issued by these countries - US$3.82 trillion - is nearly five times that figure! This suggests that, for the time being, the value of the official central bank gold reserves equals 19.6% of the value of their outstanding currency. The following chart shows a ratio between the value of the official central bank gold reserves to the value of M0 (circulating currency). Norway and United Arab Emirates have no official gold reserves. The 563.1 metric tonnes from the European Central Bank was added to the Euro-Zone, bringing the total for this economic area up to 10,975.3 metric tonnes as of June 2008. At the time of writing this article, the official gold reserves of Venezuela appears to out-value all of its outstanding currency by 78%. Both Switzerland and Kuwait have gold reserves nearly equal to the value of the currency issued. Although not included in the analysis, Lebanon has official gold reserves of 286.8 metric tonnes valued at US$8.89 billion at time of writing this article. The official statistic for Lebanese currency in circulation is only US$2.4 billion. The most recent annual year-over-year growth rate for the Lebanese Pound is 8.3%. Published on http://DollarDaze.org - Jul 13, 2008.